After I had worn my light and dark blue design for 10 days, I finally redid my nails. 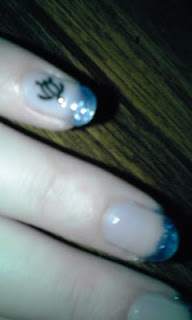 Again, I used the Maquillage dark blue polish for the tips, but left the rest of the nail clear and only added a turtle sticker to each pinky. The Maquillage polish, btw, stays on the nails really long, but the bottle is half empty already! Plus, it still looks transparent no matter how much I pile on - you have to dab it on and can't brush. I kinda don't see this on the whole nail, it just wouldn't work. Cute turtle! I'm from Hawaii, and that turtle design is seen on thousands of stickers cars in Hawaii (and even in Las Vegas, where I live). It's the symbol here in the US to tell everyone here that you're from Hawaii. Jeni, thanks for your comment!